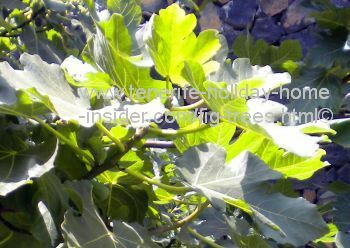 Fig trees of any type can be seen in Tenerife. Fig trees grow all over Tenerife. But not all sorts everywhere. What isn't thriving wild on a slope by Ifonche in the South or on farms in Buenavista del Norte for commercial purpose stands in people's orchards or even on street corners, such as this Ficus Carica. It's part of the most common Mediterranean and Middle Eastern types, although its leaves are slightly larger. Therefor, some would call it a black Brazilian fig. 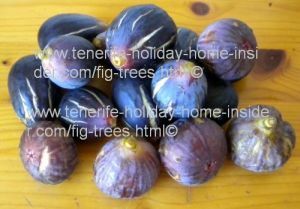 Fruit and vegetable shops sell cheap fig fruit in Tenerife when it's harvest time in the Isla Baja. A fruit shop in La Longuera Toscal charged €1 for 170g of fresh locally grown figs at the beginning of October 2014. Figs are extremely healthy both fresh and dried. Not only by their beneficial fiber and vitamins but also by a high calcium content. The latter has only been discovered lately. 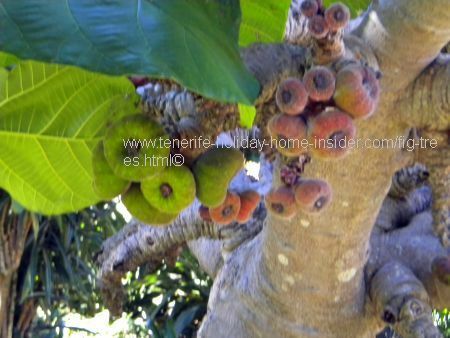 The Tenerife Botanical Gardens Jardin Botánico in Puerto de la Cruz are your sure bet at the end of summer to even see ficus flora with fruit. The fruit of the Himalayan fig auriculata which is depicted above is only fed to animals. That's not the case in the rest of the Auriculata's habitat all over Asia. Its leaves are almost round and rather large which led to its other name Elephant ear fig. It's a perennial evergreen, profusely spreading shrub. Its fruit which reaches the size of a medium sized apple doesn't only grow in groups on branches. It even clusters around the bottom of the trunk near the soil as well as on air roots around it. Ficus aspera the Rough fig is endemic in Tanna which is a South Pacific isle. This is in the remote region of many islands which were mentioned in the book Robinson Crusoe. Tanna was discovered by Captain Cook. 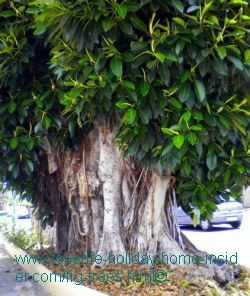 This forest fig tree which grows 20m high with an enormous rough trunk has green and white variegated leaves. They are very beautiful and soft. Almost every leaf seams to have its own pattern of green on white, or just green leaves. Therefore, a hybrid was developed from it which is now sold as ornamental plant worldwide. Its fruit are said to be sweet but are not eaten by all natives on Tanna. 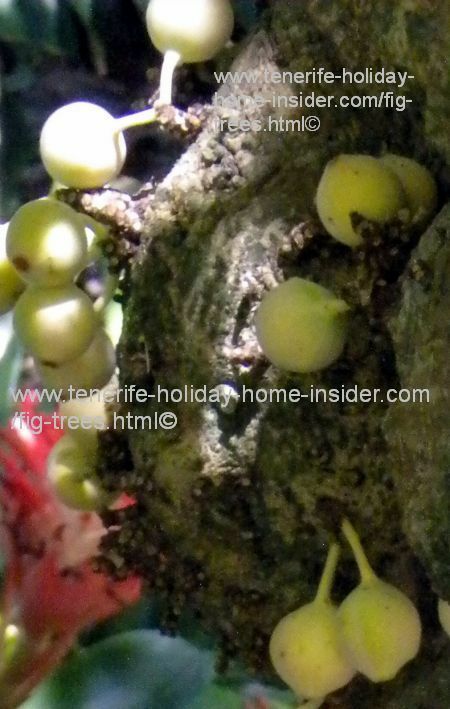 It is very peculiar that the Aspera figs are growing in pairs anywhere on the trunk and on stems. Cherries do that too but not on trunks. 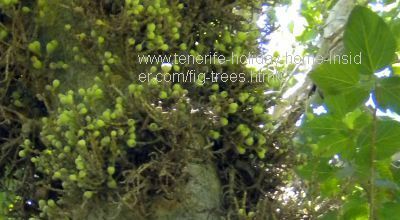 Not to forget is that this particular fig stands in the Tenerife botanical gardens like its exotic cousins. Although native to Africa and Arabia, the Ficus sicomorus grows in parts of the UK. The Sycomore, as the British call it, almost hides its trunk and branches with fig fruit. They are very small but extremely abundant. They are edible once they have turned from green via yellow to orange red. Any too many? Bats always gladly gather figs. So does much other wildlife of forests. You may wonder why this plant is listed with fig trees. 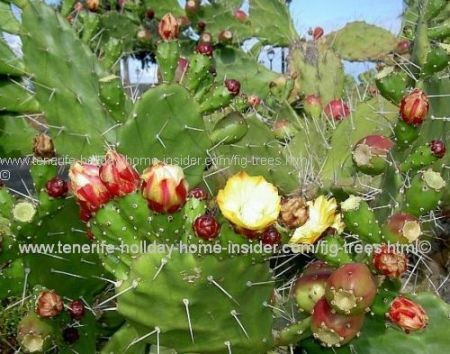 Anyway, this Opuntia ficus indica which very likely originates from Mexico is known as Prickly pear, Barbary or Indian fig and Paddle cactus.. You see it on any slopes and coastal areas of Tenerife. However, it's not the fruit that made this cactus famous. Its scale insects the Dactylopius Coccus are much more important. They shed a black substance from which cochineal is derived. That ecological dye which made fabrics beautifully purple was the craze of Europe until not long ago. That came to an end when the German BASF works invented more affordable chemical dies. The Opuntia figs need to be boiled and brushed well. Otherwise it's almost impossible to pull their unpleasant fine hairs from human skin. Depicted is a fine example of a Ficus elastica which stands by Carretera Las Arenas in Puerto Cruz. Several trunks have grown into one, as is rather common with the weeping figs the Benjaminas. The ficus elastica became popular after WW2. Much later the Benjamina stole its show. The Ficus elastica often called 'rubber tree' has strong leaves that can be more than 30 cm long. This tree comes from South East Asia and grows equally at ease in North Tenerife. It was given a safe distance from walls and pipes, as its roots are very destructive. 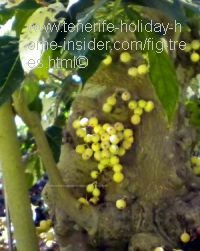 What makes the Ficus Benjamina of all fig trees special? It is one of the most popular indoor plant of figs in colder regions. It is also popular outdoors in a more temperate climate. Benjaminas used to be loved for their weeping ability. Now, you see them often as miniatures in Tenerife streets where their canopy is pruned into round shapes. You buy that highly ornamental plant with its small green leaves at many florist shops, nurseries and in large super markets. By the way, sometimes on large town squares, it's hard to tell apart some Laurel species from the Ficus Benjamina. You wouldn't expect this milky substance with a woody tree. However, care must be taken with bark and branches to avoid skin allergies. Also mind the fig wasps which still require more research. On principle, each fig has its own type of those insects which pollinates it. However, both figs as well as their wasps are still prone to evolution and surprises are expected. There is a link on the bottom of that article which leads to the giant Ficus Macrophylla which isn't really a Moreton Bay fig but a columnaris from a Pacific Isle. This Lord Howe fig's nick name strangler fig may even be outdated. Discover everything about the fig tree that you haven't learned yet, here.